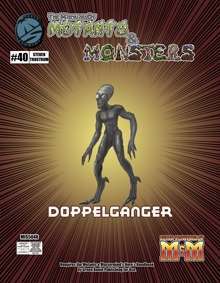 This release of The Manual of Mutants & Monsters provides game stats on the Doppelganger, a race of beings that could be from another dimension, space, or somewhere deep in the earth. Consummate manipulators, they change their shape into that of other humanoids to get what they want. Includes the doppelganger standard game stats, along with suggestions on making this race capable of also copying super-powers, and a template for making player character doppelgangers. Super-Powered by M&M and its associated logo are Trademarks of Green Ronin Publishing and are used under the provisions of the Super-Powered by M&M Trademark License (see http://www.mutantsandmasterminds.com/licensing for details). Requires the Mutants & Mastermind’s Hero’s Handbook by Green Ronin Publishing for Use.